The cosmos in my garden is still going strong and keeps me in a summer frame of mind for the moment. This one is called Purity and is rife outside my kitchen. I am going to be showing daily paintings tomorrow, Wednesday, 5-9pm and Thursday 9am-5pm at The Atrium, Whittlebury Park, NN12 8XW along with lots of vendors selling wonderful stuff with monies donated to charities Macmillan Cancer Support, St. John’s Ambulance and Helen & Douglas House Children’s Hospice. Come along if you can. A very enjoyable but busy couple of days exhibiting. A huge thank you to the Ringers for hosting. Back to the drawing board now and trying to keep ahead of the mould setting in on everything I want to paint! Here’s another plump Turkish fig…………….all the way from Morrisons. The Japanese bowl once again and a couple of fat Turkish figs. A joy to paint and then ………….lunch with a handful or rocket, some goats cheese and a squirt of pomegranate dressing smuggled home from the veggie shop in Kalkan. I’ve got to stop eating my sitters! This painting and I parted ways at Open Studios on Saturday. If you are in South Northants., the daily paintings will be on show on Saturday, 24th September 11am-5pm at Hall Farm, Radstone, Brackley, Northamptonshire NN13 5PY. A percentage of the sales will be shared equally between the Katharine House Hospice and The City of Drugs Rehabilitation Centre for ex boy-soldiers in Sierra Leone – worthy causes both. OK I’m really trying to kick this garlic habit and now I’ve given it back to Sarah so this is definitely the last………….for now. 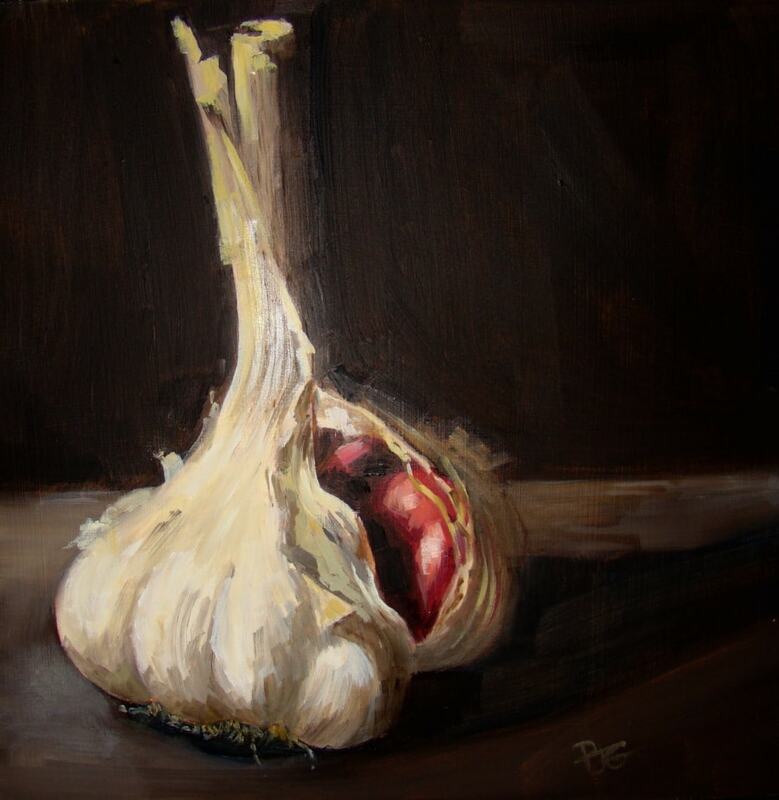 Here is another version of the garlic but this time with a sweet little enamel pot from the Bell Plantation in Towcester. It’s my daughter’s birthday today – 15, can’t believe it! Happy birthday Floss! 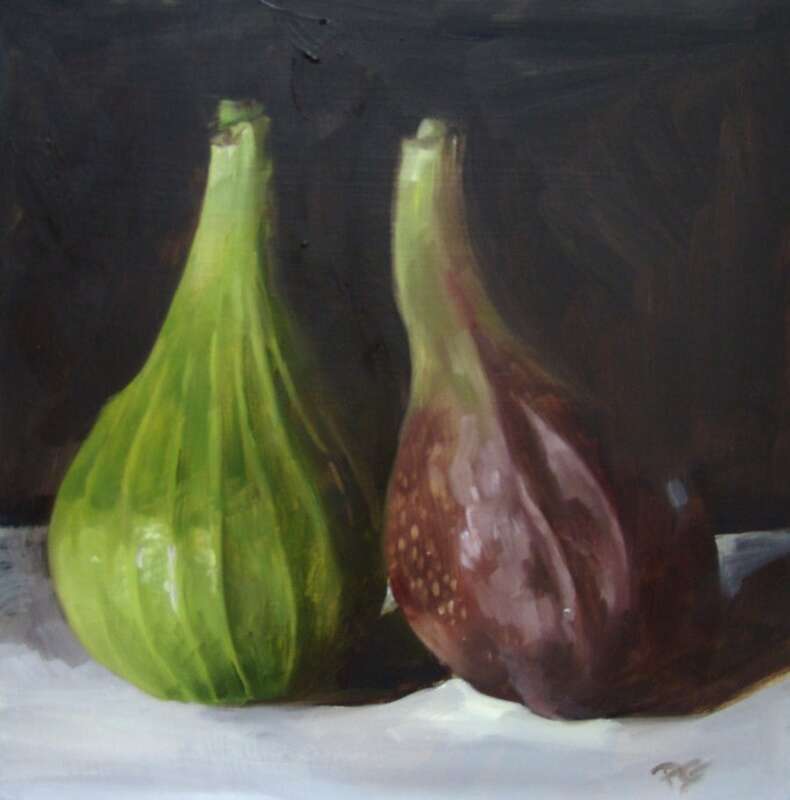 This is the last painting of the locally-grown figs as sadly, they are beginning to rot now! I suppose I could always do a Sam Taylor Wood-inspired piece but no, I think I will look out for some Turkish ones next. Life has not yet resumed to normal pace as I’m doing some teaching for the next two weeks……….not enough days in the week! This head of garlic is a prizewinner! My friend Sarah won third prize in her village produce show with it and other offerings. It was apparently marked down because it was split but to me, that’s the beauty of it as you can see its inner workings. Anyway, I painted it on Friday and sold it on Saturday so as far as I’m concerned it’s a champion! I am going to paint it again tomorrow before I let her have it back for her store cupboard. My Victoria plum tree has been groaning under the weight of a massive crop this year – so much so that the branches have had to be propped all summer. Having left it extremely late to pick them, I had to do battle with the wasps that had moved in big time. A couple of stings on the backside later and I’ve a freezer full once more. Sometime in the middle of November, the offspring start begging me to ”drop the plum crumble habit” – but for now, they’re enjoying it. Apples next…………….aww Mum! On holiday in Turkey, I was itching to paint all the gorgeous figs that were so plentiful. No paints, so I ate them instead! However, a friend of mine brought me these from her garden so I was really excited…………. sad, but true. If you are around my area (Caldecote NN12 8AG) in the next two weeks, I am taking part in open studio and my paintings will be up at Chapel Cottage today, tomorrow and Sunday as well as next Friday and Saturday. Those dates are 9th, 10th, 11th, 16th and 17th September. Hope to see some of you here. There are other forthcoming exhibitions which I will post soon. There is a damson-laden tree in our lane which drops it’s wares into the road causing a sea of blue. Certainly this year as it’s been such a bumper year for plums and damsons. The little pot is from my favourite hotel, Le Royal Raffles Hotel in Phnom Penh where we stayed a few years ago. It is like stepping back into the colonial era and the Elephant Bar there is all about gin slings and tinklings on the ivories, where war correspondents gathered prior to the fall of the city. The little jar was in our bathroom, holding cotton buds. I resisted the temptation to drop it into my bag as we were leaving and instead, bought one from reception!